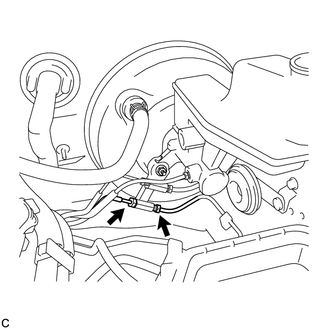 (a) Disconnect the connector and disengage the clamp. (b) Using a union nut wrench, disconnect the 2 brake lines from the front brake tube way. 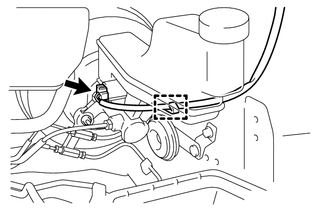 Do not damage or deform the brake lines during removal procedure. Do not allow any foreign matter into the brake lines. (c) Using a union nut wrench, disconnect the 2 brake lines and remove the No. 1 front brake tube from the brake master cylinder sub-assembly. (d) Remove the 2 nuts, front brake tube way and brake master cylinder sub-assembly from the brake booster assembly. Do not pull out the master cylinder piston. 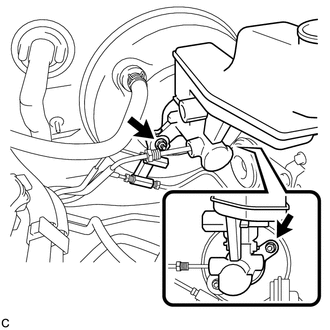 When installing the master cylinder to the brake booster, or when removing the master cylinder from the brake booster, make sure that the master cylinder is kept horizontal or its tip faces downward (the piston faces upward) to prevent the master cylinder piston from falling out. Do not allow any foreign matter to contaminate the master cylinder piston. If any foreign matter gets on the piston, remove it by using a piece of cloth and then apply an even layer of lithium soap base glycol grease around the circumference (sliding part) of the piston. Do not use any other types of grease. 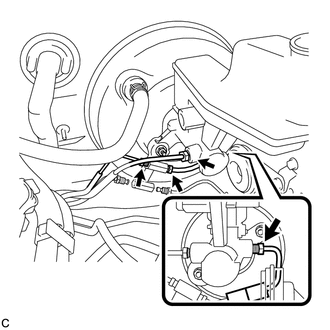 (e) Remove the O-ring from the brake master cylinder sub-assembly.